Even though I wrote more negative stuff than positive I would recommend this headphone for those who has no problem to pay the price. -Overall sound is excellent. Dynamic and well balanced. -Not so easy to put into my ears. -The black-white cord design looks cheap and not professional. GOOD BASS, balanced mid and treble(only if equalizers tweaked a little). 1) Allow them to 'burn in' for at least 12 hours. First 6 at medium volume and the last 6 at mid-high volume. Make sure it plays music with alot of range to ensure the precision driver settles in and get used to movement within its own cavity.. trust me it makes a difference. I use my Nokia N91 simply because this phone is undoubtedly the best music device I have ever heard. I created a new equalizer setting where the bass is moderately at par, the mids are low and the treble is set well above par. Try this equalizer setting in your music device and you will immmediartely hear the Bose signature sound. On my iPod video I installed RockBox.... my primary reason was to have a complete editable graphic equalizer, now it sounds better than my phone lol. So install RockBox on your iPod if you want to make these earphones absolutely cry and leave you breathless. Don't worry the installation is completely safe and reversable. It leaves the original iPod OS in tact. I believe there is a fuse in the connector where the Bose symbol is engraved, this would help regulate the power being transferred to the speakers so they don't blow... So you can effectively push these things to the limit... and beyond. Honestly, these headphones really shine at high volumes. No distortion. Just crystal clear and sparkling highs, well defined mids and thundering lows. If the bass seems too overwhelming then crank up the volume because that's when the sound more or less balances out and gives you an amazing performance. 5) Any instrumentals, the sound detail is absolutely amazing. I never knew Tears in Heaven had 2 guitarists playing and with background singers until I heard it in these Triports. I also recommend supergluing the tips on and always keep them in the case. Go buy it, keep it, cherish it. Finally!!!! Finally I have found some good earbuds!! I have only bought one other Bose product in the past - a pair of Bose bookshelf (301's?) speakers 20 years ago that were popular at the time but I totally dreaded their sound once I got them home and used them for a few months. For some reason I never returned them thinking I would eventually get use to the popular sound my friends kept telling me was so good. I never did. I have tried 3 different pair of isolating earbuds $30 and under in the past month. As soon as I popped these new Bose Triports in, I could tell the difference is quality immediately! You want bass? YOU GOT BASS! It is a very warm and full sound that I immediatley loved as soon as I heard it. I'm sure there are better pairs of earbuds out there, but after the last 3 pair I tried sounding so horrid, these sound like the best thing since sliced bread! I really like how you don't have to squeeze them deep in your ear canal to get a snug fit. Actually with these, as I think another reviewer pointed out, they sorta feel like they might fall out while you're just sitting there, but they don't...unless you vigourosly shake your heard. The size of the buds are about twice as big as those cheap $20 pairs you can get at Walmart. Almost feels like you have minature floor speakers in your ears, yet they are quite comfortable. If you don't like a lot of bass, you won't like these earbuds. But it is just the right amount for me. An abundance of bass, yet not TOO much. The overall sound is soft and warm and not harsh and trebly. I really dig the sound. I know $100 is a lot to pay for earbuds, but these sound 10 times better than the $25 Sony Fontopia's I tried last. You can really HEAR the quality with these. Bass drowns out clarity of mid and high's. Not as life-like as Bose claims. Ear inserts do not FEEL as if they are secure, but in reality they are more secure than most bud-type earphones. They do get uncomfortable after extended use despite Bose's claim to a revolutionary insert. NOT sound isolating. The bose in-ear headphones are undeniably nice. They have extremely good bass response, almost too good. Sometimes the base overpowers mid and treble. As soon as I got an Ipod I had to replace the pathetic excuse for headphones that come with it. I first bought a pair of $40 sony fontopia in-ear headphones. These were surprisingly nice for the money. After those broke (my fault, not a product malfunction), I decided to go ahead and spend extra to upgrade. My first choice was the Shure E2c's. I loved the absolutely superb sound produced by the E2's in the treble and mid, but they severly lacked in bass. After reading reviews, I saw that the Bose heaphones had strong bass and mids (and highs). At first listen the bass is very noticable, almost overbearing. As you listen to the headphones more often, however, you will adjust to the bass. I am still not fully satisfied though because the bass causes a small amount of distortion. They are fully capable of producing clear highs and mids, but when the bass is added it disturbes the clarity. To be honest, I think I will return these and spend a bit more on a pair of E4's. According to multiple reviews, these have improved bass from the E2's as well as improved clarity, complimented by a fully balanced sound. In short, those looking for bass, these headphones are for you, if you are looking for balance, try something else. Rubbish quality, fall to bits!!! For the price a second rate poor alternative. I bough these 4 weeks ago initially I was impressed with the sound quality, unfortunately that’s where it ends, I fond these poorly designed and with the exception of the sound generally poor quality. Firstly, the rubber in ear tip were constantly falling of, in fact ever time I took the out of my ears they would fall to bit! When I paid this price for them I don’t expect to have to crawl about the ground picking parts up every 5 minutes! I’ve just returned these (worst customer service ever but that's a whole other complaint...) because to top it all the cable disconnected from the jack, apparently I must have had a faulty pair, although to be honest the workmanship on it did look second rate, certainly not what I expected from a quality brand like Bose. My last headphones are 4 years old and still going strong, these lasted 4 weeks before they broke! To sum up easily the worst purchase I have ever made in my life. Absolutely dreadful, tried to deny there was a design flaw, although they did eventually agree to refund they tried to force me in to taking a replacement product. 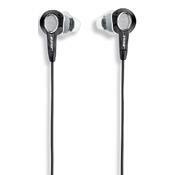 They sound very good for what they are, which is an earbud that does not need to be inserted into the ear canal. They provide decent bass, and passable sound. Great for those occasions in which you don't want to lug around a set of over-the ear headphones. Also, their not sound isolating phones, which makes them a bit safer in certain situations. They don't sound as good as comparable over-the-ear headphones or canalphones, and don't even sound as good as a set of $50.00 Sennheiser PX100s. Bass is just barely acceptable (but it *is* acceptable, mind you) and are not quite as crisp as I'd like on the high end. Also, not sound isolating which makes them less enjoyable in loud surroundings. Its probably a tossup as to whether Bose or Microsoft is the world's most hated company (would that the world's haters focused their energies on General Dynamics or Raytheon, or some other weapons manufacturer) but certainly the race is a close one. And so you'll fine no shortage of people trashing the Bose Triport series, and the in-ear phones especially. And while I agree that you can do better than the over-the ear Triports for the price, as far as in-ear phones go, the Triports are in a league all their own. That's because, as far as I've been able to determine, no one else manufactures an in ear phone that is NOT a canalphone and sounds anything near this good. They sound much better than Apple's stock earbuds, for instance. That said, if you can handle canalphones, then stop reading night now and go get yourself a set of Shures, or Etymotics or some other high-end brand, because the Bose triports will never be able to match that sound. But if, you're like me and find that shoving a piece of foam or rubber deep into your ear canal is slightly less comfortable than sitting on a broomstick, then the Bose Triports are for you. Shure E2c, Sennheiser PX100, Apple earbuds.